China’s Bao and Zhong put an early block on Cheng Wen Hsing’s hopes for two titles at the Li-Ning Singapore Open Superseries. For the second week in a row, the wealth would be shared, with Chinese Taipei and Indonesia getting in on the golden action. China badminton sensations Bao Yixin / Zhong Qianxin (pictured) have continued with their onslaught of tournament, thumping out a victory in the final, defeating the Chinese Taipei veterans Cheng Wen Hsing / Chien Yu Chin in two unanswered games in the final today, which means that the Chinese youngsters have come through to the title at this tournament without dropping a single game. The Chinese pair started the first game well, forcing the veterans to make mistakes and they took a 7-2 lead. Chien blocked into the net at 6-10 and Cheng already walked out of the court for the interval before the shuttle landed on the floor. The first game was very one-sided because the veterans were simply not able to make any sensible reply to the attack. At the start of the second game, the Chinese youngsters continued their relaxed play but the veterans began to speed up and went on to grab the lead at 11-8. The run continued and the veterans widened the gap to 14-8. However, Bao/Zhong were so quick and could get into attack mode at the snap of a finger. They made a strong run to close the gap and finally took a 17-16 lead and continued to reach their first match point 20-16. The veterans were able to save only one match point before the youngsters began celebrating their victory, having defeated the former world #1’s 21-12, 21-17. 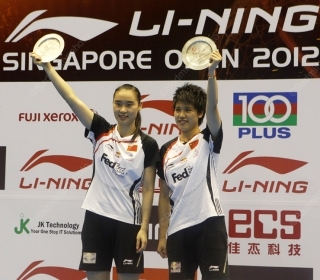 Following the victory in Japan Open 2011, this is the second time Bao/Zhong defeated Cheng/Chien. However, they had a much easier win today compared to their previous meeting. They are one step closer to becoming a world-class pair. “I think the biggest improvement we achieved so far is our understanding. We have a much better understanding now and communicate much better. This really helps a lot in our game,” said Bao. 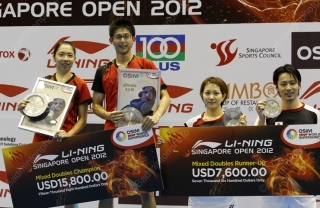 After waiting hungrily for another Superseries title for two and a half years, the current Olympic champions Markis Kido / Hendra Setiawan (pictured) have finally won the men’s doubles championship at Singapore Open 2012 by defeating Ko Sung Hyun / Yoo Yeon Seong in three tight matches. The men’s doubles final was, as often in the final, a delight to watch. Especially in the first game, nobody was going to give away big points. Both sides were going full power, with high-paced exchanges of attack and defense, each player taking a turn at pulling off near impossible returns. Kido and Setiawan were at least able to keep a cool head to quickly grab the opening game 22-20. In the second game, the Korean then stepped up their attack, being more daring and desperate in their shots, snatching a game 21-11 from the Indonesians. They fought some impressive superb rallies for the crowd to enjoy. The third game saw the Indonesians demolishing the Koreans, allowing them a mere 6 points before they clinched the title. It was a combination of long rallies of smashes and dashing to and from all corners of the court to conclude today’s men’s doubles final. The shy boy Hendra said, “At 20-all in the first game, I didn’t think too much. I just wanted to try my best to take the first game. In the second game, we were trailing farther behind, so we were actually getting ready to play the rubber. We are there, but we can’t get it! 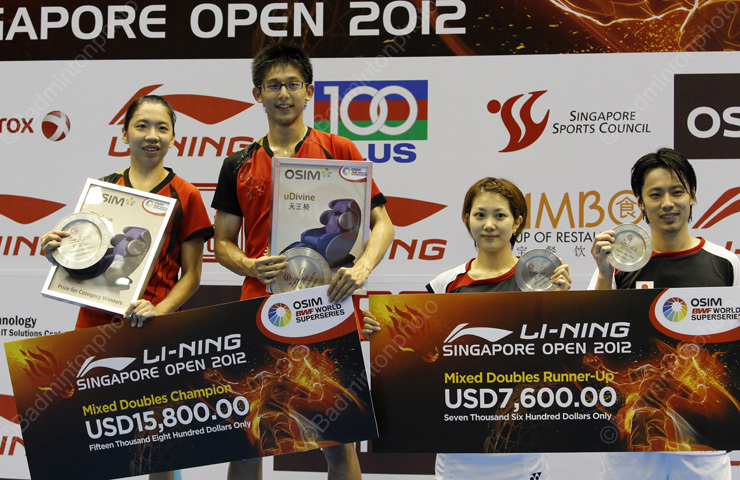 Japanese pair Shintaro Ikeda / Reiko Shiota, who were getting their taste of being in a Superseries final for the first time, lost the chance to stand on top of the podium as they lost to their opponents Chen Hung Ling / Cheng Wen Hsing (pictured right with Ikeda/Shiota) for a fifth time. The Chinese Taipei pair again exhibited superiority in their receiving abilities, which gave them openings to forge ahead and they won the first game 21-17. By the latter half of the second game, Chen/Cheng were able to smile all the way to the finish line, taking the game 21-11. “It is a very rare occasion for us to reach the final, and we really wanted to win,” said Shintaro with disappointment after losing the chance to crown. “It was very close in the first game and we were trying to keep the pace up with our opponents. Unfortunately, we lost the first game. “In the second game, especially after the interval, our opponents had a better defense and attacking than us. We had really run out of ideas after the interval. “Yes, I am quite happy to be in the final even though we lost. I hope we can prepare well for the Olympic Games after these because the coming Games will be my last Olympics,” said Reiko.